SÃO PAULO , Sep 5 2013 (IPS) - Everything indicates that the decisive battle between harnessing hydropower and preserving the Amazon will play out in the Tapajós river basin in Brazil. At stake there are a potential of nearly 30,000 MW and a vital part of the Amazon rainforest. Eight of the 42 possible dams included in the government’s energy expansion plan up to 2021 are in that area. The Tapajós river is one of the biggest tributaries of the Amazon river, in northern Brazil. Its watershed is more sparsely populated – just one million people in an area of 50 million hectares – than other areas where hydroelectric dams are being built, such as Belo Monte on the Xingú river. For that reason the Brazilian government has promised to build them there without land access, transporting staff, equipment and material by air, and to reforest depleted quarries after construction is completed. But the promises have not dissuaded the Mundurukú indigenous people from fighting against dams in the Amazon jungle. There is also gold in that area, which means garimpeiros – illegal gold miners – are active along the Tapajós river, which is set to become the best route for transporting agribusiness products from the western state of Mato Grosso, Brazil’s biggest soy producer, if plans for an industrial waterway go ahead. According to the World Wildlife Fund-Brazil (WWF-Brazil), the only way to protect essential ecosystems and species is by preserving a large central bloc of jungle and other smaller areas in the Tapajós watershed, while leaving open the Jamanxim river, one of its main tributaries. 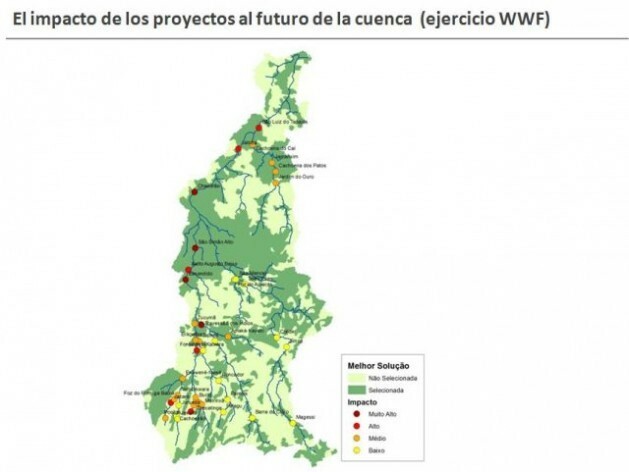 WWF developed a methodology for defining priority environmental areas which, if used in the Tapajós watershed, could serve as a basis for negotiations to help work out the conflicts and come up with better decisions concerning hydropower dams. This was explained by Pedro Bara, head of the WWF Living Amazon Initiative’s Infrastructure Strategy, in the second part of this interview with IPS. Read the first part here. Q: You are calling for the preservation of 30 percent of each one of 423 land and 299 aquatic ecosystems identified in the Amazon rainforest, as a basis for negotiating the expansion of hydroelectric dams without irrecoverable environmental losses. How would that be applied in the Tapajós river basin? A: In Amazonia, given the scant knowledge about the broad range of biodiversity, we make an approximation. In the case of Tapajós we were able to define a “Noah’s ark”, with 93 land and 28 aquatic ecosystems, 46 species of birds, 17 mammals and 37 fish, as well as 20 aquatic habitats, defined by world-renowned experts. Soil use and the expansion of agriculture and garimpeiro mining were also analysed and it was concluded that 22 percent of the territory is degraded. But 22 percent is covered by protected areas and 20 percent by indigenous reserves. The evaluation takes into account the size of the dam, forest conservation and sustainable use units, and indigenous lands. Q: And what conclusions were reached through the use of the tool you developed and the data collected? 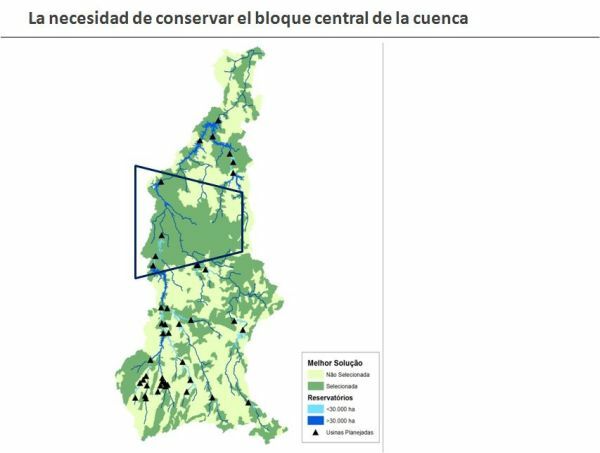 A: What we want to conserve as a minimum is this large central bloc [Bara points on a map to an area around the spot where the Juruena and Teles Pires rivers converge, where the Tapajós river is born, and where at least four dams are planned]. The other areas selected are marked with these green spots. Some dams are unacceptable, like the Chacorão, because it is in the Mundurukú indigenous territory. Q: But the government says it won’t flood any indigenous territory. A: That’s because it hasn’t put that on the table or included it in the 10-year plan for energy expansion, because it is worried about a backlash. But the Mundurukú are aware of it, which is why they are reacting. Q: What other hydropower plants are rejected under the criteria outlined by the WWF model? A: The Escondido dam, also because it will flood around 1,000 square kilometres, to generate 1,248 MW. That is twice the area to be flooded by the Belo Monte dam, which will generate nearly 10 times more energy. Between these two are the Salto Augusto and São Simão dams, which are also problematic because they are in the Juruena National Park. All four of them are in the big central bloc that must be preserved. Q: But would the government agree to negotiate about the [6,133 MW] São Luiz do Tapajós dam, which is strategic? A: No, the [Brazilian government’s] Empresa de Pesquisa Energética (EPE) [Energy Research Company] has made it clear that, although it considers our tool to be excellent, it is not open to negotiations on the São Luiz or the Jatobá dams. With these dams, and others that will have a smaller impact, half of the basin’s potential could be achieved without compromising the biological and cultural diversity of the big central bloc. There is room for negotiating. Q: The president of EPE, Mauricio Tolmasquim, said he supported the use of the tool in order to “preserve as much as possible” in the hydroelectric programme. Are there signs that the government is willing to negotiate? A: Looking at the Tapajós watershed as a whole, important elements are missing for EPE to preserve as much as possible. Mainly because not all of the environmental permits are in federal jurisdiction, and without clear coordination between the states and the central government, contradictory decisions are produced. I’m less optimistic with respect to the possibility of the government negotiating a hydroelectric programme in Tapajós. I think it still prefers one battle at a time, even if that is gradually hurting its image. But one battle at a time, without knowing where you are heading, does not help the lives of those who depend on free-flowing rivers and the conservation of critical areas like the central bloc of the Tapajós basin. On the other hand, we have seen that a broad, strategic debate is awakening more and more interest on the part of companies and financiers. 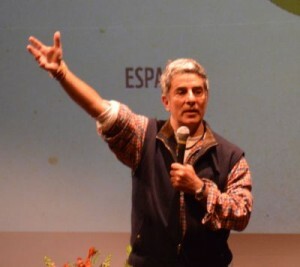 Q: But indigenous people, especially the Mundurukú, want to veto the dams. Do you think it is possible to convince them to negotiate? A: We are in the process of approaching the indigenous leaders. There are many villages, some of which are very far apart, and the Mundurukú are facing the huge challenge of how to organise themselves in the face of a major works project that affects their territory and involves powerful interests. They have to inform themselves, communicate, create participative spaces, deliberate. But the negotiation will depend, obviously, on the government’s willingness to agree to a dialogue, which must start with discussing the application of International Labour Organisation Convention 169, on prior, informed consent for local communities, but would have to go far beyond that. Q: Wouldn’t it help to have consistent development plans for the affected territory? A: But they have to be drawn up long before the works begin, not like what happened in the case of Belo Monte, which is already 30 percent built, while the development plan just began to be drafted.